Alpha Lipoic Acid is an important antioxidant nutrient that can provide protection against developing peripheral neuropathy if you have diabetes. Alpha lipoic acid has been studied for its ability to prevent nerve damage and improve insulin sensitivity. Alpha lipoic acid can be important even in those with idiopathic neuropathy rather than diabetic neuropathy since they are at higher risk for developing metabolic syndrome. Biotin is a B vitamin that plays an essential role in the body’s ability to process glucose. Biotin is used to reduce pain from nerve damage caused by diabetes. One 2011 study showed that using biotin in combination with other nutrients such as thiamin, riboflavin, zinc, vitamin B6, and vitamin B12 (all found in Neuropathease) helped ameliorate diabetic neuropathy symptoms. Biotin has the added benefit of helping to lower glucose levels in patients with high blood sugar. Vitamin B12 is included in the form of methylcobalamin- a superior form of B12 with enhanced absorption- because B12 deficiency is associated with symptoms of neuropathy. B12 deficiency occurs in elderly populations, vegans, after gastric bypass surgery, and with certain medication use (like metformin), among other reasons. Folate works together with vitamin B12 in nervous system function, DNA synthesis, and methylation in all ages and therefore is included in this formula. Like B12 deficiency, folate deficiency is associated with neuropathy. Methylfolate is the preferred form of folate over folic acid, since methylfolate is more easily utilized by the body and also better tolerated in individuals with the common genetic mutation MTHFR. In addition to vitamin B12, folate, and biotin, other B vitamin deficiencies are associated with neuropathies: thiamin (B1), riboflavin (B2), panthothenic acid (B5), and pyridoxal-5-phosphate (B6). Deficiencies of these vitamins can occur in cases of malnutrition and alcoholism, for example. Neuropath-ease contains all of these critical B vitamins. Chromium is a mineral that is included in Neuropath-ease to help prevent neuropathy in diabetics. Chromium has been used by people with diabetes to improve insulin sensitivity. Chromium deficiency was found to cause neuropathy in some patients on IV nutrition. Chromium deficiency is likely rare, however certain common medications like antacids, proton pump inhibitors, H2 blockers, and corticosteroids are known to interfere with chromium absorption. Boswellia serrata is found throughout western and central India. It is used in Ayurvedic medicine to target inflammatory conditions. Research supports its use as an anti- inflammatory agent that can help reduce pain. 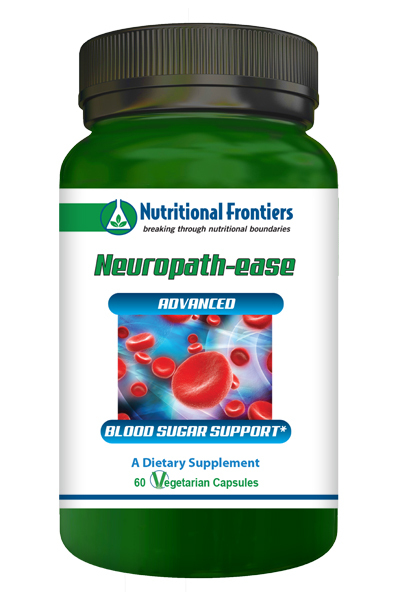 Neuropath-ease contains several B vitamins along with other key nutrients to help aid nerve cell transmission and reduce the symptoms of peripheral neuropathy. Neuropathy consists of numbness, tingling, and sometimes weakness and is caused by damage to peripheral nerves. Peripheral neuropathy can occur as a result of diabetes, Lyme disease, chronic liver or kidney disease, AIDS, and other diseases. Neuropathies may also be seen with nutritional deficiencies, medication side effects, and more. Sometimes neuropathy is “idiopathic” in which case the cause of the condition is unknown. To properly find the cause of neuropathy, please discuss all medication use with your physician since some medications can cause neuropathies either as a side effect or by contributing to nutrient deficiency. People with diabetic neuropathy may be able to help their neuropathy symptoms by achieving better blood sugar control. One way to do this is by modifying diet, exercise and supplement intake- all of which can be done with the guidance of a qualified integrative healthcare practitioner. According to some research, people with idiopathic peripheral neuropathy are at higher risk of developing metabolic syndrome, which consists of high cholesterol, high blood sugar, high blood pressure, and obesity. Again, lifestyle changes and appropriate supplementation can have a positive impact. For people who already suffer from peripheral neuropathy, please be careful to wear well-fitting footwear and moisture-wicking socks: feet should always be kept clean and dry. Patients with peripheral neuropathy should be diligent about monitoring the health of their feet, checking for areas of inflammation, calluses, sores, bruises, blisters, etc. Other ingredients: vegetable cellulose (capsule, microcrystalline cellulose, vegetarian leucine. Caution: Do not take this product with other supplements containing high dose B vitamins except under the supervision of a qualified healthcare practitioner.